103 Lincoln st, Santa Cruz. 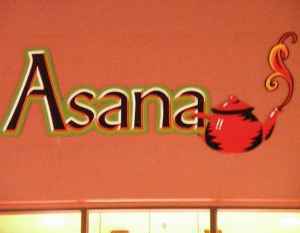 Per Asana: Generally slots are open and flowing, so if you want to perform for the house please just come on down and let the host know. He will make sure you get to play. Slots are generally around 15 minutes long. This is primarily an acoustic event. 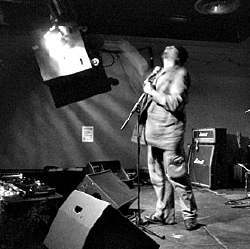 Full electric bands are encouraged to size down to an acoustic set. There will be a PA system and a single acoustic amp provided! Just bring yourselves and be ready for a beautiful evening. This event is hosted by the Santa Cruz Superfoods Co op. Corralitos Concert 2010 – Band Wanted! This was listed on Craig’s List yesterday so it may still be available. This also just looks like a great show to check out. 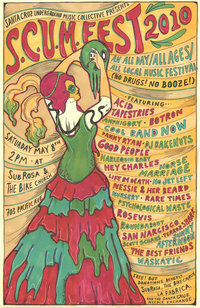 We need a band for Sunday, May 30, 2010, to play a short 90 minute set, from 10am to 11:30am. Prefer bluegrass, jazz, swing, acoustic, blues, etc….. Will be opening act for Corralitos Concert 2010 at the Corralitos Grange Hall, with the Western Skylarks, Steve’s Jazz Kitchen, and the Shawn Maderios Group. There is a stage inside with lots of room, ok electricity, no PA system. Grange seats 300 max but will be set up for less. Pays $50 a head, cash monies, no roadies, groupies, agents, included, just band players. 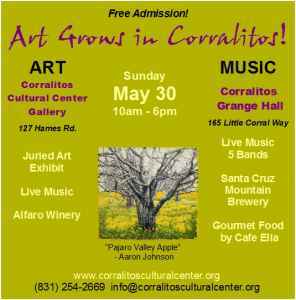 This is a free concert open to the public, and a non-profit fund raiser for the Corralitos Cultural Center artists. The annual Corralitos Padres Pancake Breakfast, also takes place in the morning at the Corralitos Community Center nearby, with thousands of local residents in attendance. There is also an all day Art Exhibit next door, which will draw additional visitors through out the day. See our ad in this week’s Good Times. Reply with a brief description, type of music, number of band members, how long playing, YouTube link if any, and contact information. INFO: 6-9 p.m. Friday, June 4. Santa Cruz Rehearsal Studios, 118 Coral St., Santa Cruz. Free. 425-7277. Excerpted from an amazing article on Stacie by Cat Johnson (found here – Eerily Engaging: The Work of Stacie Willoughby). 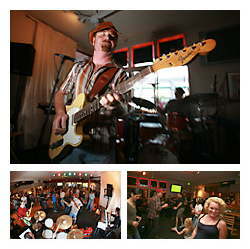 Santa Cruz Sentinel – Add your event on thier calendar and check out which music writer covers your genre. 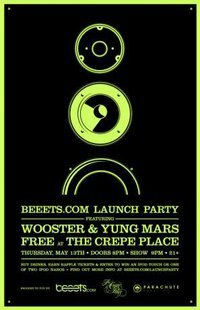 Santa Cruz,’s own Beeets.com, the only events search engine powered by your interests, will launch Thursday during a free show at The Crepe Place . 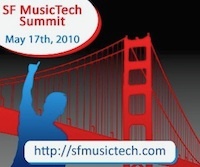 Featuring local bands Wooster (Santa Cruz) and Yung Mars (San Francisco), the show will be free to the public and include raffle prizes such as iPods and T-shirts. The launch party will coincide with the release of The Crepe Place’s new web site, built by Lyon Bros. Enterprises and powered by Beeets.com events. Beeets.com is a new service that allows people to post, search and share events based completely on their interests. Events are “tagged” with descriptive words, allowing people to quickly filter through the local events listing by clicking on one or more interests. This unique interest search makes it easy for people to post and find events that wouldn’t fit into the few pre-defined categories on other events sites. Beeets.com is an ad-free experience that aims to get people off the web, into their communities and having fun with their lives. Beeets enables local groups, including music venues, sports teams and community organizations, to have a central place to post and manage their events, not only on the Beeets website, but on their own websites as well. Using the simple drop-in Beeets Widget, organizations can pull their events listing from Beeets.com into their own sites. The Beeets Widget makes it easy to maintain an up-to-date list of events on any web site, and also allows people with similar interests to easily find these events on Beeets.com. While this is a free event, all donations made at the door will benefit the SubRosa Infoshop and The Bike Church. There will also be opportunities to donate to La Fabrica and The Santa Cruz Needle Exchange. Please respect the spaces which are hosting, and remember that this is a drug-free/booze-free event. You can be a good guest and still have a good time. Accroding to the SCUM Facebook page, the list above represents the bands currently confirmed to play, and may be subject to change. However, they are no longer accepting applications. SCUM (Santa Cruz Underground Music) is a loosely organized group of folks interested in booking and promoting DIY shows, networking and gathering resources, supporting each other in musical and artistic endeavors, and building a culturally rich community. SCUM meetings are the first Saturday of the month at 3pm at 107 Blackburn and the third Sunday of the month at 3pm at 215 Storey. Bring snacks and ideas if you have them!